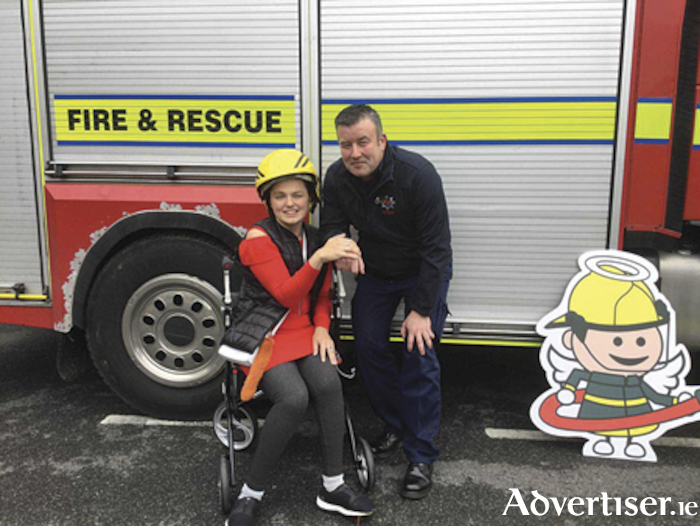 Irish Wheelchair Association (IWA ) Athlone was joined by Athlone Fire and Rescue at the Community Centre in Clonbrusk to officially launch their ‘Angels’ national fundraising campaign. Athlone Fire and Rescue started the campaign by introducing IWA’s new Fireman Angels Pin and Angels Christmas products which will be sold by volunteers throughout Athlone on Thursday and Friday, November 8 and 9. IWA provides a range of essential services to people with physical disabilities from its Community Centre in Clonbrusk, Athlone. The Community Centre is a hub of activity and a place where people can come to get advice and support, develop new skills, learn to drive or participate in training programmes and sports leagues. Each year, IWA provides over two million hours of vital services to people with physical disabilities in their own homes and communities. Speaking at the launch of the Angels Campaign 2018, IWA Angels Coordinator, Ann-Marie Raftery for Athlone remarked, “IWA’s Angels Campaign is the largest campaign in our fundraising calendar and enables IWA to generate vital funds to help us to continue to maintain the level of services provided to people with physical disabilities and their families throughout Athlone. “Volunteers will be selling Angels products outside stores throughout Athlone. If you come across one of IWA’s volunteers please purchase an Angels product or make a donation to ensure people with disabilities can enjoy equal rights, choices and opportunities and live their lives independently”. To make a donation to IWA during the Angels campaign or for information about events and collections in your area, please visit www.iwa.ie/angels or contact Ann-Marie Raftery, Angel Coordinator, on 090 6471165 or email [email protected].